You might wonder, why not just pull out the microwave stuff. It’s a staple in so many homes. Easy and good movie night snack, right? Hold that thought. The synthetic butter flavoring is diacytel and may cause lung problems and most of the bags are lined with perfluorooctanoic acid, a carcinogen. Don’t worry! There’s another option. Homemade is the way to go. 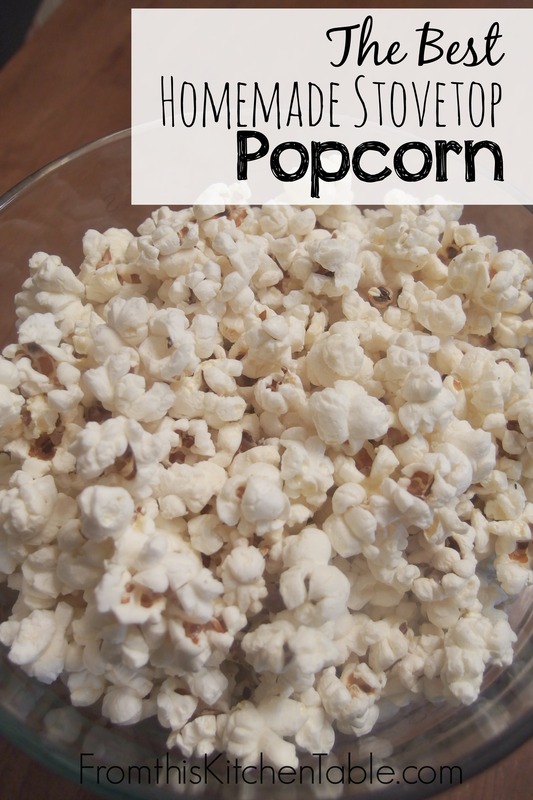 If you are looking to simplify homemade popcorn even more, check out a Whirley-Pop Popper. This is the gadget we normally use, and it’s even easier. Today, though, I put my kernels in a good old pot and shook it around the old fashioned way to show you it can be done. 🙂 The bonus of using a heavy bottomed pot is that you get a little extra arm workout. 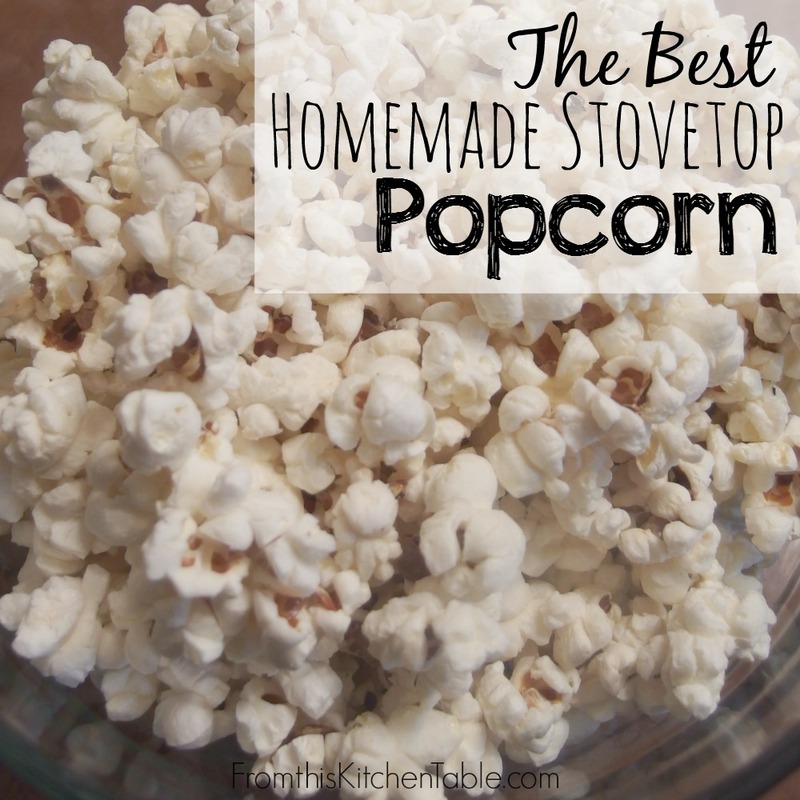 I’d say, if popcorn is something you just make once a month or a couple times a year, go with the pot method. If you make it weekly (or more – I’m telling you, it’s that good and easy. I love a snack I can give my kids in minutes. ), investing in a Whirley-Pop Popper is something you might want to do – and it’s not even that expensive. Let pan sit on stove until the 3 kernels pop. Remove lid and add ½ cup of kernels. Replace lid. In the beginning shake pan every 20 or so seconds. As the corn begins popping, shake every 10 seconds. When the popping has stopped, pour popcorn into a bowl. Melt 2 tablespoons of butter. drizzle half of if over the popcorn and sprinkle with a little salt. Toss. Drizzle with the remaining butter. Toss. Add more butter and salt to taste. 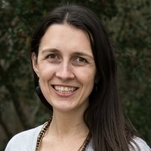 This entry was posted in Appetizers, Food, Recipes, Uncategorized on November 21, 2014 by Deanna Michaels. My family loves popcorn too! We don’t have a popper so we always use the stovetop. One of our babysitters taught me if you sprinkle a little sugar in with the kernels you can get that kettle corn taste! My husband would like this because he likes air popped popcorn. We LOVE popcorn with coconut oil! Yummy! Lol! Old age is sneaking up on us! Thanks for stopping by. Interesting! I didn’t know that about craving it if anemic. We love the coconut oil, makes it taste a bit like movie theater popcorn. There’s also expeller pressed coconut oil which is flavorless. Lol, it is kind-of funny for me too because I just dump stuff in the pop and make it. 🙂 I guess if you are used to putting a bag in the microwave the stove might be a bit scarier. I love the whirley-pop!!! I think you would too. It and an air popper make popcorn nights super easy!